In order to care for your public assets, you need a reliable inventory of parts and supplies. But manual inventory tracking can be time-consuming and error-prone. That’s why we’ve focused on improving barcoding capabilities in Cityworks Storeroom. Storeroom 1.1, which is compatible with Cityworks 15.2.5 and newer, supports barcode scanning to search for materials and filter material lists. Here’s how to get started. Storeroom 1.1 is designed to use the built-in camera on a tablet or smartphone as a barcode scanner. Simply center the camera over a barcode and allow it to focus. Once the camera focuses, Storeroom processes the barcode and pulls up the item in the Material List. Cityworks is also designed to recognize Bluetooth® scanners. They serve as a “keyboard shortcut” to quickly and accurately find material in your warehouse or vehicle. Bluetooth scanners can connect to a Bluetooth-enabled computer, as well as Android or iOS devices. You may also use an integrated warehouse solution from Radley Corporation, a Cityworks development partner. Radley’s barcoding and data collection software provides a complete productivity solution for public agencies using Cityworks. Learn how Radley Corporation streamlined operations for the City of Independence. Whether you choose to use a barcode scanner or smart device, you have the freedom to use Storeroom anywhere—in the warehouse, on a truck, or in the yard. Many products already have barcodes on their packaging. To use the manufacturer’s part number as a Cityworks material number, simply open Storeroom and go to the Material page under Config. Select the material, then enter the manufacturer’s part number in the Part Number field. Now, when you scan the product barcode, it will open that item in Storeroom. You can also create your own barcodes using third-party software. For example, with Crystal Reports, you can create barcodes for specific Storeroom fields. Note: Although the Description field is an option, its corresponding barcode tends to be long and difficult to scan. 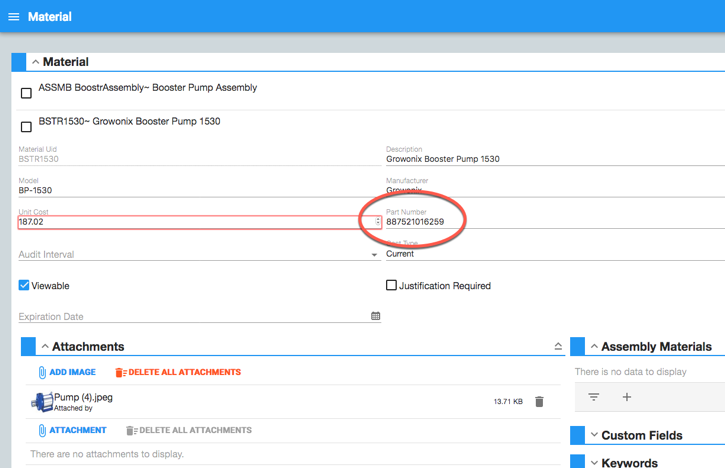 Use the Material UID, Part Number, and Location fields for best results. Organizing inventory shelves? Use magnetic vinyl pouches to place barcode labels on your metal racks. That way, when you need to move or update the barcodes on your shelves, you’re not stuck with outdated adhesive labels. Once you’ve set up your barcode system, material audits will become quicker, easier, and more accurate. Simply scan a barcode, select the item, and perform a cycle count. Storeroom will make the necessary adjustments for the stock on hand and the next audit date. Just one more tool in your toolbox to help you work smarter, not harder. Free webinar: Learn how the Town of Scarborough Department of Public Works reduced material costs and administrative bottlenecks with the help of Cityworks Storeroom. By Brad Johnson, industries practices manager at Cityworks.